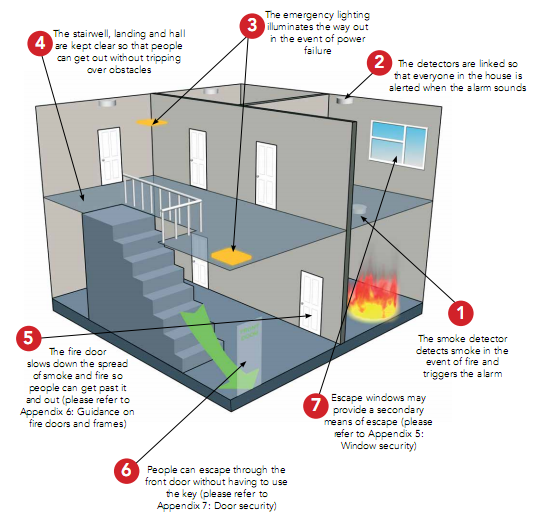 The requirement for a Grade A LD2 Fire Alarm is such that should you have a HMO (House of multiple occupancy) with 3 floors or more then one of these systems should be installed which includes a fire control panel, smoke detectors, heat detectors, break glass units and sounders. The Grade A LD2 fire alarm system needs to be installed to BS5839 pt1 and you should employ a competent engineer to do this. Once the system is installed a weekly test of the system is required and the information is to recorded. Additionally the fire alarm system is to be maintained by a competent engineer every 6 months and this information is to be recorded too. A fire risk assessment is also required under the Regulatory Reform (fire safety) Order 2005 as you are a landlord/owner of this type of building and is a requirement by law. Currently we have a full fire safety pack which includes fire alarm, emergency lighting and a fire risk assessment. Starting from £1797. Contact us now to discuss this.